True alpine plants are native to high altitude, mountainous regions of the world, and they have adapted to the naturally harsh weather conditions by becoming short in stature for the most part. The range of shapes and sizes is remarkable, however, and we have grouped plants into 6 distinctive styles. The first is described directly below. Use the menu to the right for more styles. These plants grow flat to the ground, or almost flat. Sometimes the flower stems may be more upright but the foliage is essentially flat and ground-hugging. Also known as a mat. Many carpeting plants are evergreen. Most types will root themselves into the soil along their horizontal stems. After a couple of seasons it’s usually possible to sneak small pieces that have already rooted themselves, and to move these to a new location to start another patch. Carpeters are great for covering the space in between other taller kinds of plants. Carpeters will lay flat against rocks and take on their undulating shape in a very charming way. These are terrific for stuffing into crevices and small soil pockets. They are great at finding soil and nutrients in tight places. Some kinds are suitable for growing in between flagstones in paths and walkways. Certain types are better than others at tolerating foot traffic. Our Advanced Search allows you to find these types easily. 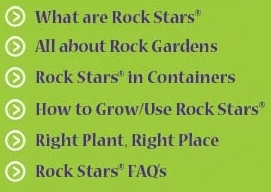 In a container or trough, carpeting Rock Stars® will cascade nicely over the edge of the pot. Walls are an ideal place to grow these as well, to take advantage of their cascading effect when grown more vertically. To see different Rock Stars® with a carpeting habit, try using our Advanced Search to locate them quickly and easily. Spreader - basically like a taller version of a carpet. These plants often have a cascading style when grown on a wall or at the edge of a container. Tuft - also known as a mound or clump. Stems tend to arise from a central point, usually with an upright habit. Cushion - a domed-shape habit, like a little round pillow. Rosette - leaves are joined together at a central point, radiating like the spokes on a wheel. Hen-and-chicks are a classic example. Subshrub - basically, low-growing shrubs. Perennials with a woody base.